Occupational therapists contribute to the care of children and adults with intellectual and developmental disabilities (IDD) by focusing on activities and goals that are meaningful to the individuals and their families. Relevant performance areas include cognitive, sensory, perceptual, motor and psychosocial activities. Goals for intervention can range from self-care to supporting participation in a work environment. The ultimate goal is to foster community integration and participation. Occupational therapy assessment is designed to understand the individual’s strengths and areas of concern, within the context of the current environment and family/community culture. 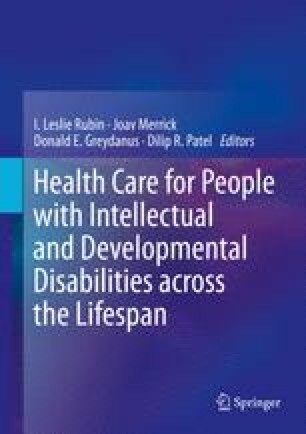 In this chapter, the types of interventions for individuals with IDD at different life stages are discussed, and examples of evidence-based outcomes are presented. American Occupational Therapy Association. Occupational therapy practice framework: domain and process, 3rd ed [Internet], 2013. URL: http://tinyurl.com/qfpy9r5. Autism Speaks. Top 8 autism therapies – reported by parents, 2012. URL: http://www.autismspeaks.org/blog/2012/09/25/top-8-autism-therapies-%E2%80%93-reported-parents. The Autism Society. Federal legislation: laws regarding education for people with disabilities. URL: http://www.autism-society.org/living-with-autism/navigating-services/federal-legislation-legal-issues.pdf.